Bricks and Cobblestones is a whimsical quilt block pattern that explains how to easily make a quilt from 2-1/2" wide strips of fabrics. The designs are perfect for jelly roll strips but work just as well when you cut your own strips of fabric. Bricks and Cobblestones make wonderful scrap quilts but are just as lovely when you work with a more limited range of colors. The examples on pages 3 and 4 are illustrations of quilt blocks made with tone-on-tone fabrics and prints. Bright geometric fabrics, dots, stripes, tone-on-tones, and small prints are excellent choices for a quilt but don't hesitate to choose any other theme that suits your needs. Refer to the quilt block diagrams on page 2 for assembly diagrams. Each cobblestone quilt block finishes at 6" x 6". Each bricks quilt block finishes at 6" x 1`2"
Use two different types of fabrics per block if you want to make a quilt like the one in the photo above. For example, if you choose a tone-on-tone for Fabric 1, choose a bright print for Fabric 2. Sew with a quarter inch seam allowance throughout. Use straight pins to secure fabrics before sewing. If you prefer not to use pins, try pressing aligned pieces with a medium hot iron to help them stick together. Gather the fabrics set aside for a Cobblestone quilt block. Sew a 2-1/2" Fabric 2 square to opposite sides of a 2-1/2" Fabric 1 square. Press to set the seams (not essential but improves the accuracy of any patchwork). Sew a Fabric 2 rectangle to each long edge of the row you assembled in Step 1. Press seam allowances either direction. The block should measure 6-1/2" x 6-1/2". Repeat to make additional cobblestone blocks. Gather the fabrics set aside for a Bricks quilt block. Sew a 2-1/2" Fabric 2 square to each short side of the 2-1/2" x 8-1/2" Fabric 2 rectangle. Set seams and press seam allowances either direction. Sew a 2-1/2" x 12-1/2" Fabric 2 rectangle to each long edge of the row you assembled in Step 1. Press seam allowances either direction. The block should measure 6-1/2" x 12-1/2". Repeat to make additional brick blocks. Arranging Bricks and Cobblestone quilt blocks into a quilt layout is a bit like creating a jigsaw puzzle. Use a design wall or other flat surface to arrange blocks side by side. Leave the room for awhile and see if you still like the layout when you return. If not, shuffle the blocks around a bit more and check again. 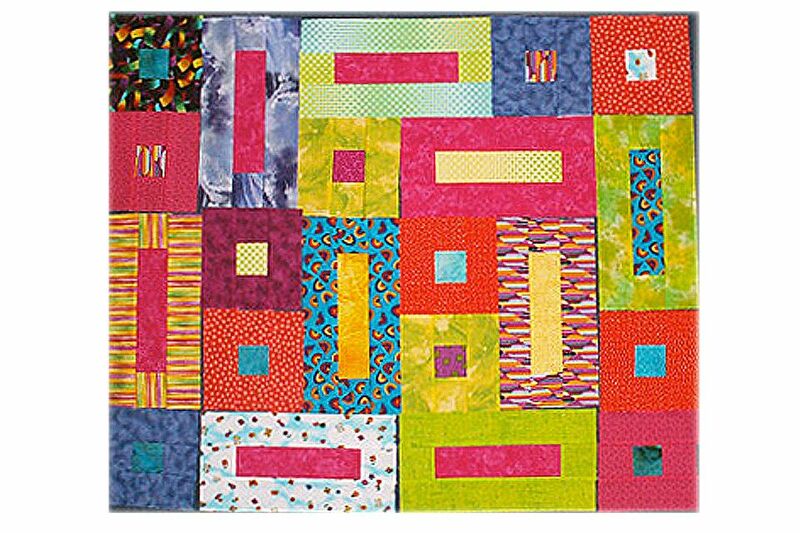 Create a few additional quilt blocks if you feel they will help you balance the quilt's overall color and contrast. Two cobblestones and one brick quilt block arranged but not yet sewn together. Two cobblestone blocks line up perfectly with one brick quilt block.